The Gowanus Lounge: Was Fourth Avenue Slope Rezoning Flawed? Was Fourth Avenue Slope Rezoning Flawed? Was the rezoning of Fourth Avenue in Park Slope seriously flawed? We'd argue that it was in several respects, in particular in that it allowed tall (for Park Slope) buildings without requiring any affordable housing. Yesterday, Normal Oder tackled the subject in a very extensive and thoughtful item on his Atlantic Yards Report. In hindsight, the rezoning of central and northern Park Slope seems an unwise move, favoring some powerful constituencies—homeowners in an affluent district, real estate developers, and an unbending city administration—without requiring commensurate equity. 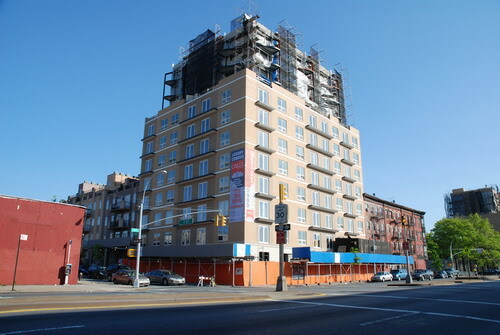 Now luxury buildings have sprung up along Fourth Avenue, replacing light industrial buildings and three-story apartments, and previous residents have been displaced. Developers—and the people from whom they bought property—have reaped the benefit. Interestingly, the person that Council Member Bill de Blasio appointed to Community Board 6 as part of the Atlantic Yards Massacre a couple of weeks ago, is Brad Lander of the Pratt Center for Community Development, who will chair the Housing Committee and is an advocate of affordable housing. It's significant in more than an academic way, as CB6 will clearly have hand in the shape of the Gowanus rezoning, both in terms of what areas are rezoned for housing, the densities that are allowed and the extent to which affordable housing is addressed and how. David Yassky is the coucilman for Greenpoint, Williamsburg and Park Slope. The only difference with Park Slope is it is where Yassky lives. No affordable housing in his neighborhood. Fourth Ave was the lower income section of Park Slope. This zoning will now displace these poorer families. Mr. Yassky is a hypocrite and a racist. He has also been silent during the calls to save usless bulldings on the Domino Sugar Site in Williamsburg in an atttempt to prevent affordable housing there which iis another heavily hispanic area. Displaced whom? The people living in the Danken auto parts store? In the parking lot that became Hotel Bleu? At most, you're talking the loss of a few market-rate apartments in what was an increasingly expensive neighborhood to begin with. There may be legitimate reasons for affordable housing requirements, but "displacement" is a red herring. Residents on the surrounding sketchy blocks, which now have new high priced developments, will be displaced. Yassky had no interest in affordable housing in his neighborhood. He is a hypocrite and a racist. Sorry, that's preposterous. Park Slope is already an expensive neighborhood--these buildings may add more pricey apartments but they won't make the neighborhood more expensive than it already is, even on the "sketchy" blocks. Just so the facts are clear the South Slope/Greenwood Heights 4th Avenue re-zoning which was past in November '05 does have an affordable housing incentive, but not a requirement. Specifically, the re-zoning allows an F.A.R. of 7.2 as opposed to 5.4 for open market housing (33% more square footage!) I do not know of any developer who has taken advantage of this incentive (not to say that some may have), and my experience is that developers in general are not interested in this seemingly attractive incentive. This begs the question as to why affordable housing incentives like this are not taken advantage of.